Spring has officially hit, at least on the calendar! I’m still waiting for the weather to catch up 😉 But I do know it will be here before we know it! So, why not start planning for it now? Plants, greenery, flowers…. These are what come to mind when I think Spring in Virginia. I’m beyond ready to see color outside and inside again! 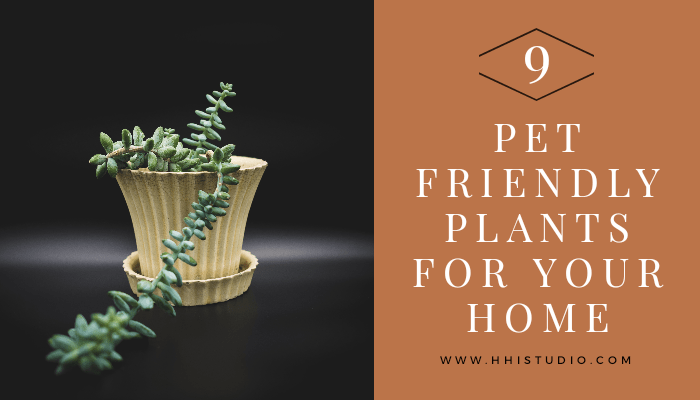 But, what pet friendly plants should I use in my home? What plants are safe around my dogs? Many common indoor house plants that seem popular with interior designers are actually quite toxic for cats, dogs, or both! So, I’ve done some research. And I’m sharing my recommendations for pet friendly plants to use in your home or garden. Before we dig into these pet friendly plant suggestions, I’d also like to remind you to check out the ASPCA website for additional information on plants that are toxic to dogs and/or cats. You can search their site a few different ways including by animal (cat, dog, or horse), common plant name, or scientific plant name. While I’m sharing a few common plants, there are so many others, too. I was quite surprised to see so many of the common house plants are toxic as I researched plants to recommend. Keep reading below to learn more about plants that are safe to use around your cat. Spruce up your kitchen with natural elements you can use in your meals and are safe for your dogs and cats. Basil, thyme, cilantro, mint, and parsley are great options! And, how adorable would it be to have new pots like these from Amazon? However, there are some herbs that aren’t safe for your four legged family members, so make sure you check with the ASPCA database before adding any herb to your kitchen garden. 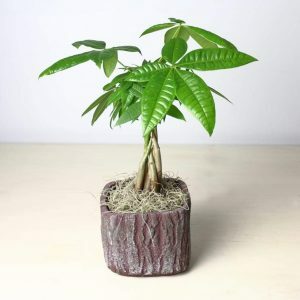 Gorgeous Money Tree (Pachira Aquatica) shown in a textured bark pot. Photo by York Flowers in Washington DC and Annapolis MD. This is one of my favorite plants. Not only because I think the name is amusing (money does grow on trees!!). But I also love it’s appearance, especially the beautiful shape and green of the leaves. It’s also perfect if you’re like me and always over-water your plants! While this is not a toxic plant, it is advised to not use this plant in a home where the pets nibble on leaves. The ASPCA website does say that if it’s ingested, it should only cause minor tummy irritation in your pet. Huge shout out to York Flowers for this beautiful image above of a Money Tree. If you’re in the DC area and need a florist, make sure you check them out. You can find them on most social media outlets, including Facebook, Instagram, and Pinterest. Those of you that know me, know that I’m a fan of color, and this plant definitely incorporates more than just green into your home. It’s known for the rich purples, pinks, reds, and greens that make up its leaves. This is a great plant for spaces that don’t have bright or direct sunlight. Plus, according to AirSoPure it has been shown to help purify the air around it, making it a great choice for health in addition to appearance! Also known as the Horse’s tail, Donkey’s tail, or Lamb’s tail, this plant is another easy to care for plant. As the name suggests, it does get long (around 4 ft in about 6 years) and needs a supportive planter for its eventual weight. It does well hanging, but can also sit on a table or shelf. Flowering is possible, but it is very rare. The ponytail palm is a slow growing and easy to maintain plant. If you travel a lot or are forgetful of plants, this is the plant for you! Its bulbous base stores water, so you want to be sure that you have given the plant enough room in the pot. Also, make sure you do not over water this plant. I really enjoyed reading tips and tricks associated with this plant from the blog, Joy Us Plants. If you’re looking for a plant that needs minimal (and I do mean that!!) attention, this is the one for you. It is on the larger side, with leaves up to 2 feet tall, but it is extremely sturdy! Fascinating fact that I learned from Gardening Know How is that this plant is related to the lily family. According to them it “has small purple flowers that only appear near the soil surface and are hidden in its foliage.” Make sure to check out the link above for additional information on how to care for this plant. While the name didn’t seem familiar to me, once I saw the image, I immediately recognized it. According to The Spruce, this is one of the most common ferns. And it’s clear to see why with such a luscious look! This is another fairly easy plant to maintain and looks great in just about anywhere! I think I went to heaven when a friend recommended this plant and I found out that it is indeed pet safe! It has rich purples and greens (with the occasional yellow flowers). And because of the raised hairs on the leaves, it is also referred to as the Velvet Plant, Royal Velvet Plant, or the Purple Velvet plant. It is a fast growing plant. Young plants make great table decor, and once mature will takes on a sprawling growth pattern making them wonderful for hanging planters. This plant is often referred to as a “baby rubber plant” because of its petite size (largest varieties of this plant typically don’t exceed 15 inches). And, because of the sizing, it makes it a great addition to most design schemes and locations. It is also important to note that you must be sure that the plant you are looking to purchase is an American Rubber Plant or within the Peperomia family. Other Rubber Plants are not pet friendly and quite toxic to dogs and cats. What to do if you believe your pet has ingested something poisonous? If you know or suspect that your pet has ingested a toxic plant or substance, it is highly recommended that you immediately seek medical attention for them. In our area, we have a few emergency vets that we know and trust. Research emergency options for your pets in your area and have this information handy BEFORE it ever becomes needed. The ASPCA also has a 24 hour animal poison control hotline available: 888-426-4435. (Add that number to your phone contacts now!!) In most cases, you will be charged $65 via credit card for their assistance. We have used this hotline a few times. One of our emergency vets even used the hotline for a fertilizer that Pebbles ingested a few years ago. (Long story short, the fertilizer she consumed would not harm her and the manufacturer would pay for the calls to the hotline because it was so common for it to be consumed by pets!!). 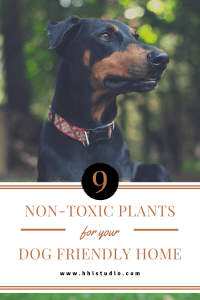 If you have dogs, you should be aware of the non-toxic plant options. 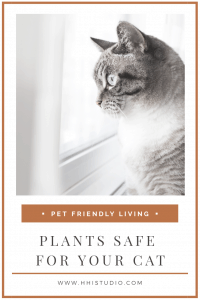 I hope you have enjoyed this round up of safe plants for your pet friendly home. As a dog mom, I know how scary it is to know that something in your home or yard may not be safe for your dog or cat. Even if you may have used poisonous or toxic plants in the past, don’t fixate on that. Instead, do your research now and be proud of the fact that you are making changes as you learn more. Focus on growth: in yourself and in your new pet friendly plants! 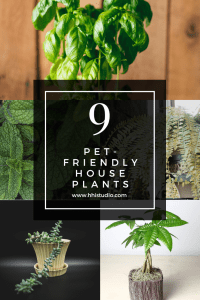 Here are a few pet friendly house plants: burro’s tail, money tree, basil, mint, and boston fern.